To order a printed copy of the Sunsail Flotillas brochure, simply click the Request button below. View the Sunsail Flotillas Online Brochure Now! If you love sailing or have a passion for new and exciting experiences, Sunsail is your perfect choice. Founded in 1974, we are the largest sailing holiday company, delivering great value sailing holidays with a cutting edge fleet, in the world's best cruising grounds. We offer a wide choice of water based holidays with over 800 yachts in 26 locations throughout the Caribbean, Mediterranean, South Pacific, Indian Ocean and Europe. We also feature Flotilla sailing holidays, Sailing Schools, Events, Hospitality, and our very own Racing Calendar, catering for sailors at every level; from complete beginner to expert. No matter your level of competency, experience or party size when it comes to sailing and yachting, Sunsail has something to suit everybody. 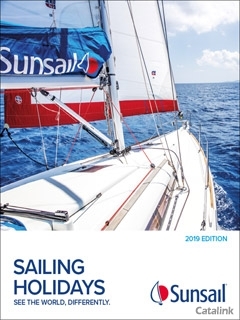 Order your Sunsail brochure now for sailing holidays you won't find elsewhere. By pressing the Request Printed Brochure button you give consent to Sunsail Flotillas (and their Data Processors for the specific purpose of delivering your literature) to send you their Brochure .